It’s hard to imagine a high school football stadium in any city, in any state, with a more picturesque setting than Clairemont, with sweeping vistas from Point Loma to Mount Soledad, with the glistening waters of Mission Bay below and Pacific Ocean in the distance. On Friday nights, while the teams are warming up, you can gaze out at the auburn orb of the sun plunging into a hazy blue horizon. The view below isn’t as pretty. The Clairemont Chieftains, ahead of last Friday’s home game against Santana High, are massed in an inflatable blue tunnel with an orange spear on the side, then charge onto the field through a phalanx of 32 cheerleaders and their shimmering pom-poms. That’s it. 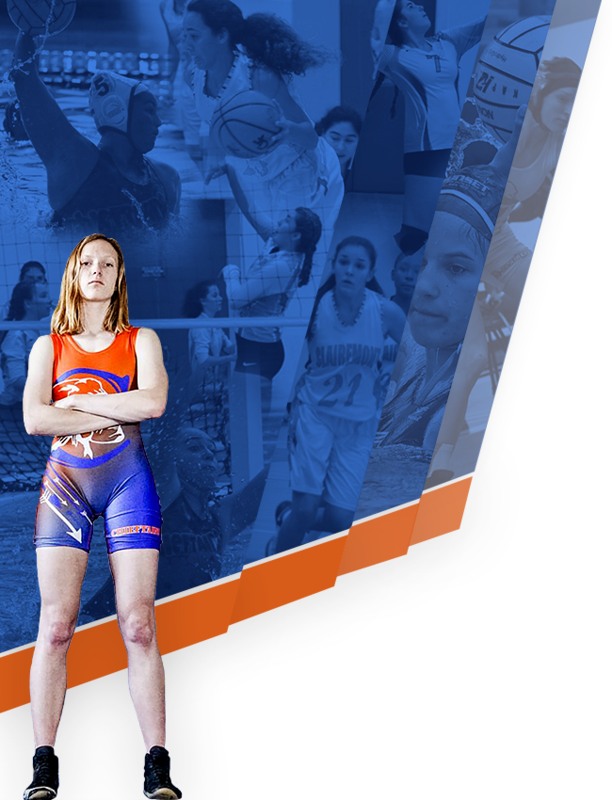 That’s all the Clairemont varsity has available. Two linemen are hurt. Two of the three tailbacks are out due to concussion protocol. They’re 0-3, outscored 125-20. The JV game scheduled for that afternoon was cancelled by mutual agreement because of short numbers. There is no freshman team. That’s better than last season, when they suited up 17 for a varsity game at San Diego High (and somehow trailed only 17-14 at the half). Their sideline, once the game started, consisted of four coaches and six players. The 21 suited up to face the 44-player Santana Sultans remove their helmets and line up for the national anthem. Standing in front, shoulders back, chin thrust high, jaw clenched, eyes closed, is head coach Manny Diaz. He grew up in the neighborhood, went to Clairemont, played football at Clairemont, now lives in a condo across a canyon from the recently renovated football stadium. When he returned as head coach two years ago, he wasn’t the first Diaz to hold the position; his father, Manny Sr., was head coach in the late 1990s. The anthem ends. Diaz squats and touches the green artificial turf, then taps his heart and looks skyward into the fading light. It is an act of resilience, of defiance. And symbolism, a solitary figure thrusting a sword into the gathering darkness, battling a growing amalgamation of external forces methodically tearing apart his lifelong passion and purpose. “I wish I could plant the seed and make the tree grow faster,” Diaz told me a few days earlier. “It’s an ongoing fight. But it’s something worth doing for me. The positives outweigh the negatives, I believe that. I know what this sport did for me. And I don’t like to fail, and I won’t fail. It’s not just Clairemont. Roster numbers are trending down at high schools across the county and country, by 6.5 percent from its peak in 2009-10, according to the National Federation of High School Associations. Pick your reason: shifting demographics, a broader variety of youth sports options, early specialization eliminating the multi-sport athlete, skateboards, video games, cell phones, a nationwide decline in school-aged children and — the biggie — parental fears over repeated concussions leading to chronic traumatic encephalopathy (CTE). Chula Vista’s Castle Park High, which won two CIF titles in the 1990s and reached the final on four other occasions, has forfeited its last two varsity games because roster numbers dipped into the teens. Escondido Charter scrapped a game two weeks ago. Valhalla, a decade removed from playing in a CIF final, has no JV team. Madison High, the city’s premier public school program, has no freshman football this year. It’s not everywhere. There are still schools with big rosters, with parents who think the CTE scare is overblown, but it is rapidly partitioning the sport at the high school level into haves and have nots. Two Fridays ago, there were 19 shutouts — a staggering amount for an interscholastic sports section with about 40 varsity games per week. Diaz keeps watering his roots. After graduating from Clairemont and playing at Division III Redlands, he returned to coach for his father at Clairemont. 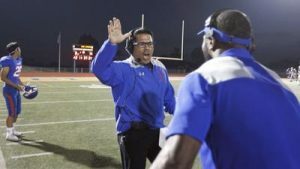 He has since been offensive or defensive coordinator at some of the area’s most successful programs, regularly playing for CIF championships, but for his first head coaching job he opted to return to the old neighborhood. His first hire: his father, as linebackers coach. He walked onto campus and quickly noticed something: “It was a shock. 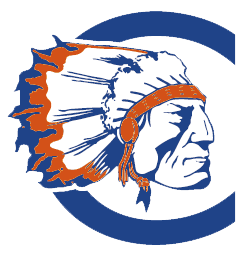 Wow, this is a much smaller school.” Clairemont’s enrollment this year is projected at 968 — barely half what it once was — and that includes about 100 special education students. Diaz is athletic director and an AP Spanish teacher. But he can do the math: He’s drawing from a smaller talent pool at a time when fewer and fewer kids are jumping in. So he organizes educational sessions with parents about safety precautions, explaining “we’re not going to put your kids at risk.” He has two athletic trainers at games, a chiropractor, a doctor. He helped craft a scheduling initiative for city schools to move JV games from Friday to Thursday, so players eligible to participate in both have an extra day to be evaluated by medical personnel. He helped organize a local flag football league starting at age 5, with games in the stadium that looks out over Mission Bay and the Pacific Ocean. He has given informational talks at the middle school across the street. Last year he converted someone who tried out as a kicker into a defensive starter and wide receiver. This year, he patched together a roster after 17 seniors graduated and he had only four returning varsity players. Several years ago, infused with $4.9 billion from two bond measures for infrastructure improvements and with CTE just entering the public consciousness, the San Diego Unified School District made a decision that history may one day view as irresponsible: Building or renovating football stadiums — lights, turf fields, bleachers, goal posts, press boxes — at all 15 of its high schools first, before replacing antiquated classrooms or installing air conditioning. 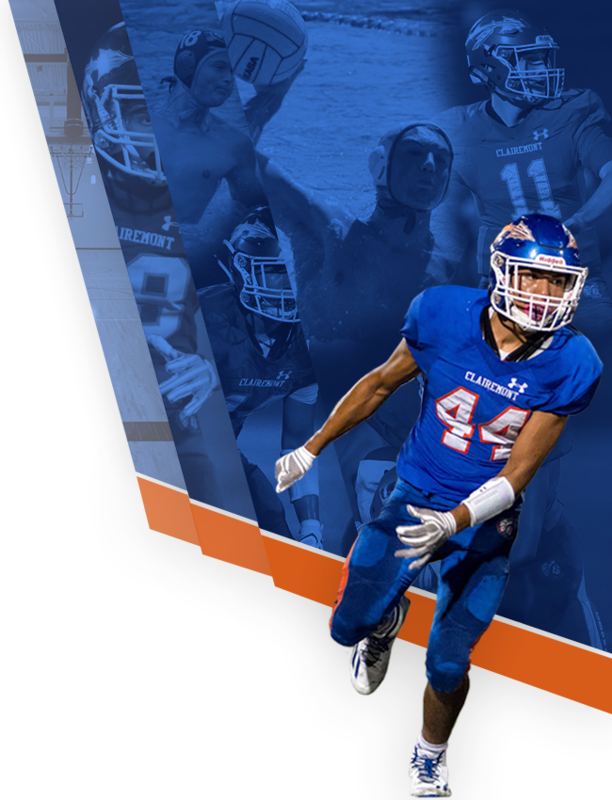 The upgrade of Clairemont’s 2,400-seat stadium cost $7.6 million. Kearny got a new $10.7 million stadium. Crawford’s cost $15.6 million. All told, more than $100 million was spent on football facilities. How long before one of them has no team to play in it? The 21-player Chieftains kick off, and Santana promptly drives 63 yards for a 7-0 lead. Soon it’s 14-0. But the Chieftains hang tough, closing to 14-7 at the half. Then the sophomore quarterback takes a shot in the ribs and comes out for a few plays. The backup QB is the only tailback they suited up. Then two more linemen go down. The players shake hands, remove their helmets and kneel in a tight circle around their coach, eyes locked on him, pieces of turf matted to their sweaty foreheads. The bad news: They’re 0-4. The good news: They have a bye this week, a chance to get healthy. “I think we took a giant step forward tonight,” Diaz says in the gathering darkness. “It’s coming, guys, it’s coming. We’re going to work out the kinks. We’re going to be fine, I’m telling you.